ACE rotary dampers are filled with a high viscosity fluid – usually silicone. The fluid is passed through an orifice or groove. The damping torque generated depends on the fluid viscosity and the orifice configuration. A constant damping force is rotationally created with Continuous Rotary Dampers. The output connection can be direct on the rotating shaft or linear via gear and rack. At a maximum rotational speed of 50 revs/min and a maximum cycle rate of 10/min, the rotary dampers still have more than 80% of their damping torque after 50,000 cycles. Limited Rotary Dampers have a restricted working angle. 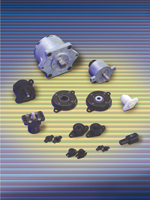 They are available with fixed or adjustable damping torque. The adjustment is made with an integrated set screw. In the standard unit the damping is in both directions. Other options available are, clockwise or anticlockwise rotations with free, non damping return.